With a particular emphasis on tumor dormancy in breast, lung, prostate, and liver cancers, as well as in melanoma, this first volume of a new Springer series focuses on the interrelationship between biological processes of aging and tumors—both dormant and quiescent. With detail supplied by numerous international researchers at the forefront of cancer research, the book examines a host of differing aspects of the topic. Featured contributions analyze the role of the quiescent state in regulating hematopoietic and muscle stem cells. They also explore the mediation, by the kinase, in the reversible quiescent state of a subset of ovarian, pancreatic, and colon cancers. 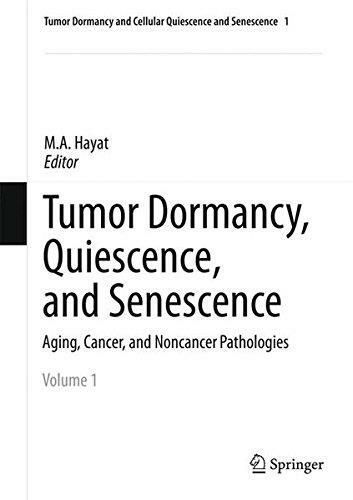 The book includes key research on the molecular mechanisms underlying stress-induced cellular senescence, in addition to those governing the accumulation of reactive oxygen species, and the induction of premature senescence. It also provides information on suppressing cellular senescence in the most common, and most aggressive malignant primary brain tumor in humans, glioblastoma multiforme. With comprehensive and cutting-edge information on therapeutic interventions and on the correct diagnosis of relevant neoplasms, and with numerous color illustrations, this is the most up-to-date assessment of current medical knowledge in this crucial area of medical research.